Denon, the household name for premium quality audio systems has recently released one more high-end 7.2 Channel Full 4K UHD A/V Receiver to the market. The new AVR-S910W comes with very impressive specification to grab attention from Home Theater geeks. We got a chance to spend some time with this state-of-art product and test its worth. We must point out this, with experience from earlier Denon products, our expectation was set high on this model. Will AVR-S910W uphold the legacy of Denon‘s built-quality and performance? 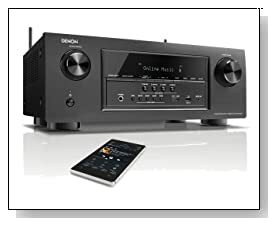 We will try to answer this questions and more in our Denon AVR-S910W review. Powerful 7.2 Channel platform powered by Dolby Atmos immersive surround sound decoding. Full 4K pass-through UHD support. Audyssey’s advanced DSP audio processing. Built-in Bluetooth and Wi-Fi connectivity features. 8 x HDMI inputs and dual HDMI outputs. Advanced Quad-Core 32-bit DSP Processor clocked with four 300-MHz DSP cores. Upscale SD and HD content to 4K Ultra HD. 90W (8ohm, 20Hz-20kHz,THD:0.08%) Power Amp, 185W (6ohm, 1kHz, 1ch driven) Power Amp. 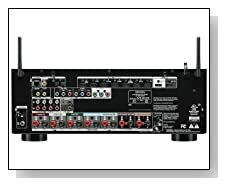 Denon AVR-S910W comes with specification everyone dream about. The company has made sure that all its customer needs are met more than expectations. Powerful specification of the receiver brings incredible home theater experience, we felt like sitting in a sophisticated cinema hall. The surround sound effect with this high-end unit is something every HT geek should experience at least once. From official sources, Denon will be releasing firmware update with supports DTS:X soundtrack decoding, 3D soundspace is on the way! AVR-S910W has got future ready connectivity options including dual antenna Wi-Fi and Bluetooth support, 8 HDMI input ports with 4K Ultra HD compatible HDCP 2.2 and dual subwoofer output. The device also supports AirPlay and thousands of internet radio stations including Pandora, Sirius XM and Spotify Connect. With its 7 channel surround sound system, you will have freedom to use 5 channels in main room and 2 Channels with a separate subwoofer in another room. It doesn’t take much time to setup and start using this awesome 4K A/V receiver, a clear on-screen Setup Assistant comes along with the device to help you out. If you’re already used/using Denon products, we don’t have to explain much on built-quality. The AVR-S910W looks superior and expensive. Stylish brushed hairline metalized front panel gives elegance to the receiver. Overall, the Denon AVR-S910W is powerful and good looking product which meets, if not exceeds our expectations from a premium model. We didn’t notice any sort of problems we could highlight. If you have enough money in wallet and looking only for best product, then this A/V Receiver should easily be your first choice.